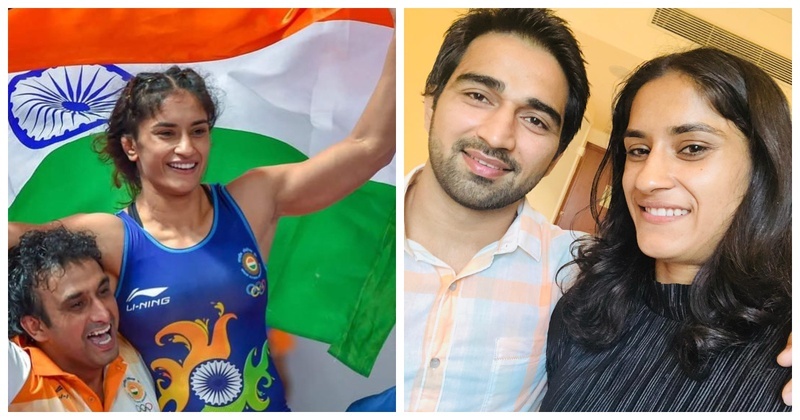 Vinesh Phogat - the woman who made history on winning the historic Gold medal at the 18th Asian Games in Jakarta (and being the first Indian woman to bagg it), is her happiest self for reasons more than this! The wrestler returned to India on Saturday which coincidentally was also her 24th birthday. And while she was gearing up to celebrate her victory and her birthday, little did she know something more special awaited her back in Delhi! Her long-term boyfriend and former national-level wrestler Somveer Rathee had planned a surprise proposal. He had been planning to propose her on her birthday, so he rushed to the airport as soon as her lady-love landed and popped the question right outside the airport! ….and she said yes in a heartbeat. The much-in-love couple is said to have exchanged engagement rings at the airport in the presence of Vinesh's uncle Mahavir Phogat (yes the Dangal dad) and Somveer's mother. They even cut their engagement cake at the airport itself, which I think is just adorable! Here’s wishing these love birds a lifetime of happiness!